Searching for the best Whatsapp tricks? Here are the best Whatsapp Tricks & Tips To Chat Like A Pro. Almost everyone uses a WhatsApp messenger to chat with friends. There are a lot of hidden features in Whatsapp. Also, WhatApp adding new features in every update. So, here are the best tips and tricks of WhatsApp. You can use WhatsApp like a pro with these tips and tricks. WhatsApp has more users than any other messenger. And it is fast secure and best messenger. It is available for every mobile like Android, Blackberry, Windows Phone, IOS and also web version is available for using it on a PC. If you have an internet and Whatsapp messenger on your phone, then you can send unlimited messages to your friends. You can share photos, audio, and videos with your friends. You can also make a call with WhatsApp around the world. There is no need to install any third party apps to use these WhatsApp tricks and tips. Many third-party apps are available to use WhatsApp with more features but these apps are not safe. So, don’t use these apps. Some people use these apps to prank their friends. But, these apps may contain malware. So, don’t download any WhatsApp application from unknown source. If you prefer the security and privacy first. Don’t use any third party app to use WhatsApp. WhatsApp has many hidden features and everyone doesn’t explore all the features. Here are the best ‘Whatsapp Tricks‘ and Tips. Run 2 WhatsApp in 1 Android. There are a lot of apps and tricks to run multiple WhatsApp on one smartphone. Some people are using third party WhatsApp applications to run 2 WhatsApp on their phone. Also, these apps may contain malware. While using dual SIM mobile phones, you may need to run WhatsApp from both numbers. But, Whatsapp doesn’t allow this. Android has a multi-user feature, which means you can add more users in Android. So, if you want to run 2 WhatsApp on your phone, just create a new user and install WhatsApp. With this, you can use multiple WhatsApp in one smartphone. Go to Settings > User > Add user. After that install WhatsApp on new user account and login with a new mobile number. Note: You need to switch user to use 2nd WhatsApp. It is very easy to switch user in Android. So, these are the best WhatsApp writing tricks. WhatsApp allows sending a message in bold, italic and Strikethrough format. You can use this feature to highlight your message. There is no option to send your message in Bold, Italic, and Strikethrough format. But you can send a message in these formats. Here’s How To Send Message In Bold And Italics Format In Whatsapp. WhatsApp officially provides this feature to send messages in Bold, Italic, and Strikethrough formats. These are also best WhatsApp Tricks. You can Also send a message in WhatsApp without updating last seen. This is the best trick to prank with your friends. To send a message without changing last seen, you need to turn off data connection or wifi and send the message. After that exit from WhatsApp and turn on Data/WiFi and your message will be sent in the background without changing last seen. This is an old but good trick to send a message without updating last seen. There are many “Whatsapp tricks” available, but this is one of the best trick of WhatsApp. WhatsApp also allows you to check the time when your message was read by your friend. You can know the “read time” and “delivered time” of the message that is sent by you. To know the time when a message was read, Press and hold on message and tap on ‘INFO’. After that, the read time and delivered time are shown on the screen. You can save special messages in the Starred message folder. This is also a unique feature by WhatsApp. It is difficult to find some special messages in whole chat. So, you can save these messages in the Starred message folder to read again later. To save the message in a Starred message folder, Just tap and hold on message and tap on the Star icon on the top. To read messages later, Open WhatsApp and tap on the three dots on the top right and open Starred message. You can send a message to all your contacts at once. WhatsApp has a feature to do this. This feature is useful when you want to send the same message to all your friends. This feature is also best to send a wishing message on a special day like New Year and a festival day. To send messages in bulk, Open WhatsApp and tap on three icons at to the right of the screen and select New Broadcast. Create the new list and add friends to your list. This is a very useful feature when you don’t want to delete the chat from WhatsApp and you don’t want to see that chat thread in WhatsApp. In that case, you can use Archive chat option. To Archive the chat thread, Tap and hold on the chat and tap on the archive icon (first icon on top of the screen). To Unarchive the chat thread, Open archive chats from the bottom of the chat threads. After that, tap and hold on chat thread and tap on the unarchive icon. Are you tired from unwanted notification from Group chat and notifications of messages from some friends? Now you can mute any chat and groups to get rid of unwanted notification. You can mute chat for 8 hours, 1 week and 1 Year. If you don’t want to receive notifications from any group, you can mute it for one year. You can also mute any chat thread. To mute chat in WhatsApp, Tap and hold on chat thread and tap on the mute icon. After that select the time. There is an option of Show Notification below the time and uncheck this option. So, this is another useful trick from other Whatsapp tricks. You can also quote any message in WhatsApp. With this, you can add your comment at the bottom of any message. This is another good feature by WhatsApp. To quote the message Tap and hold on the message and tap on the quote icon. After that, you can add your comment in quotes message. You can also set a custom notification for your favorite contacts. With this feature of WhatsApp, you can also set different notification ringtone for every contact. Also, you can manage notification for every contact. In this setting, you can also manage pop notifications. You can also set font sizes of chat as per your requirement. 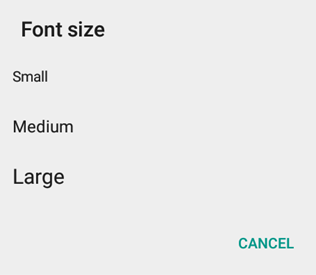 There are 3 options (Small, Medium and large) to set the font size. By default medium size set in WhatsApp. If you love large fonts, then you can set it large. To change the Font Size in WhatsApp, Open Whatsapp and Go to Settings > Chats > Font Size and choose the font size from small, medium and large. If you want to delete all chat threads at once and quickly, then you can also do this in WhatsApp. WhatsApp has options to delete All Chats, Archive All chats, and Clear all chats with one click. These options are very useful when you want to delete or archive all chat threads quickly. To Delete, Archive and Clear all chat threads at once, Go to Settings > Chats > Chat History and select options. Don’t like the default background wallpaper of WhatsApp while chatting? Now you can set any wallpaper which you want. You can set any image as background wallpaper. There are many solid colors also available in WhatsApp to set as background. To change Background wallpaper, Go to Settings > Chats > Wallpaper and choose the wallpaper. You can also change wallpaper while chatting by a tap on three dots and tap on a wallpaper. This is another great feature by WhatsApp. Now you can change the language of Whatsapp. WhatsApp provides many Indian languages. Your smartphone must support these languages. You can set the Hindi language because all smartphones support this language. To change the language of WhatsApp, Go to Settings > Chats > App language and select any language. While network problem, you may want to know, is WhatsApp is connected or not. Because in the poor network area, you may not receive WhatsApp notifications properly and sometimes you have to face the issue with sending messages. You can check if WhatsApp is connected or not without sending a message to anyone. To check if WhatsApp is connected or not, Go to Settings > About and help > System status. This is not a trick but it is necessary to hide last profile picture for your privacy. You can also hide last seen and status. There are 3 options (Everyone, My contacts, and Nobody) to hide last seen, status and profile picture. If you don’t want to show your last seen to anyone, you can set last seen to nobody. To hide last seen, status and profile picture, open WhatsApp and go to Settings > Account > Privacy and set all 3 options to My contacts. Note: If you hide your last seen, then you can not see the last seen of your friends. Though, these are not a Whatsapp tricks, these are the basic settings of WhatsApp. Every user must set these settings. If you don’t like Popup notifications, you can turn it off. Also, you can set up Popup notification as per your requirement. Sometimes you don’t like the Popup notification when your smartphone is locked for privacy purpose. You need to setup popup notifications. To set up Popup notifications, Open Whatsapp and Go to Settings > Notifications > Popup notification and choose the option. To turn off Popup notification, select “No popup”. WhatsApp provides the calling feature. It is very useful to make a call over the internet with WhatsApp. But, it consumes more data. If your data are limited then you can turn on this option to high usage of data during the call on WhatsApp. To turn on low data usage of calls, Go to Settings > Data Usage > Low data usage under Call settings. If your data is limited, you need to turn off auto media download. After turning off auto downloading of media, you need to tap on the media file to download it. You can set these options as per your requirement. To manage Media auto-download Open Whatsapp and Go to Settings > Data Usage > Media auto-download. After that choose options from When using mobile data and When connected to WiFi. You can Manage auto-download of Images, Audio, Videos, and Documents. If you are using the limited data plan on your mobile phone, then uncheck all marks from When using mobile data to turn off media auto-download. Blue ticks tells that message has been read. But, if you don’t like this feature, then you need to turn this off. To turn off Read Receipts, Go to Settings > Account > Privacy > Read Receipts and turn off read receipts. You can also create a shortcut of chat to the home screen. With this, you can start the chat with your best friends with one click. So, you can create shortcuts for frequently used contacts. To add chat shortcut to the home screen, Tap and hold on chat and tap on three dots and tap on More and select Add Chat Shortcut. This is an old and simple way to read the message without going online. Simply turn off data/WiFi and open a message in WhatsApp. After reading the message close the WhatsApp and turn on data/WiFi. Your last seen will not be changed. WhatsApp allows us to set a profile picture with 1:1 size. It means it’s supported only square size profile pictures. So, when we set any profile picture, WhatsApp forced us to crop the image in square size. So, if you want to set your full-size image as a profile picture, you need to make an image in square size. SquareDroid is an app in which you can convert your photos into square shape. With this app, you can set the full-size image as profile picture in Whatsapp. In iPhone, there is an option to hide WhatsApp images from the gallery. But, on Android, there is no option available to hide WhatsApp images from the gallery. So, if you want to hide WhatsApp images from the gallery, you need any file manager app to do this. Here are the Top 5 Best Free File Manager Apps for Android. Open File manager and Open Internal memory of the phone. Go to Whatsapp > Media. Put a dot (.) at the front of WhatsApp images folder’s renames. You can also hide any folder with this method. Here’s How To Hide Folder In Android without any app. This is a simple Whatsapp trick to hide images. WhatsApp provide the backup of chat to Google drive. If you want to move your chat from old phone to new phone, then you can also do this with a backup option. Open WhatsApp and Go to Settings > Chats > Chat backup and select the google account and Create the backup on your old phone. Now install WhatsApp on the new phone and log in with your number. Select the Google drive backup when prompted. So, these are the best WhatsApp tricks and tips. Also, many Whatsapp hidden features are there. Write in a comment, which is your favorite “WhatsApp tricks” and tips. Wow. It helped me alot . Thanks for sharing. I found this very useful. Guys check this out.